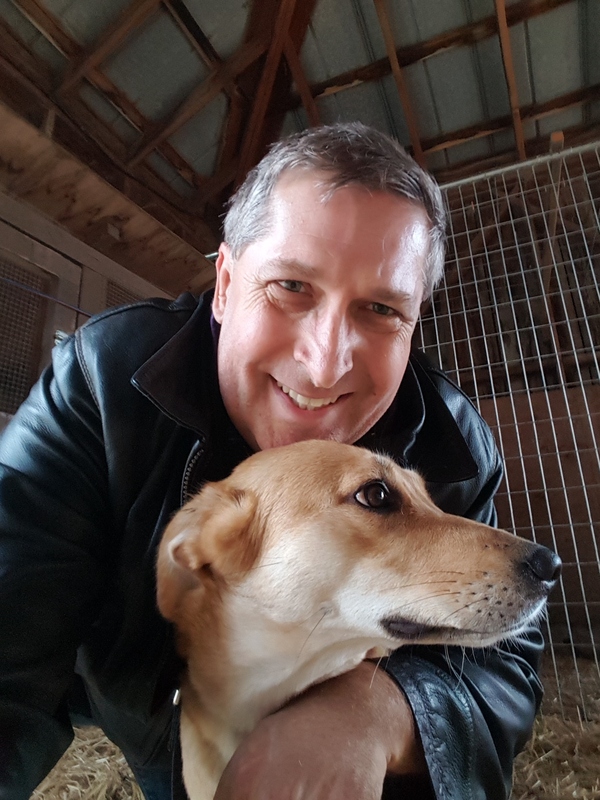 A year ago, Gwenie arrived from Amman, Jordan, saved from certain death by my dear friend Captain Cassie Wyllie, whom I’d met in Afghanistan during an air-ground engagement in the Hindu Kush. 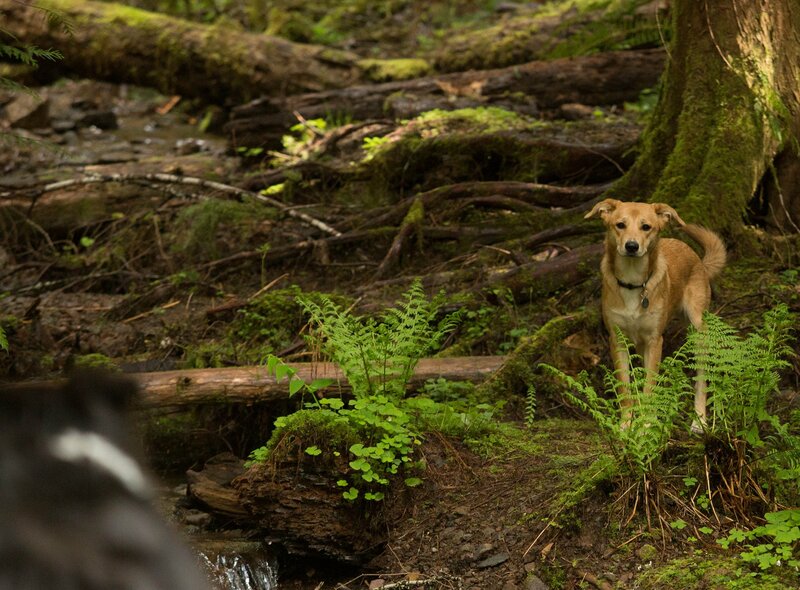 Gwenie’s arrival in our little Oregon town turned the household into utter chaos, and it has yet to settle down as Gwen blazes a trail through life that is one part raging curiosity, one part stark terror at everything, and three parts hurricane-force destruction. So, there we were, out in the ‘hood for a midnight walk not too long ago. I had just purchased a new leash for Gwenie which is a little longer and more robust than the ones we’d been using. As we stopped for a restroom break on my lawn, a dark shadow flitted across my neighbor’s driveway. Gwenie saw it first and bolted straight for it without any warning. Seriously, she went from full squat to Carl Lewis on fire in an eyeblink. 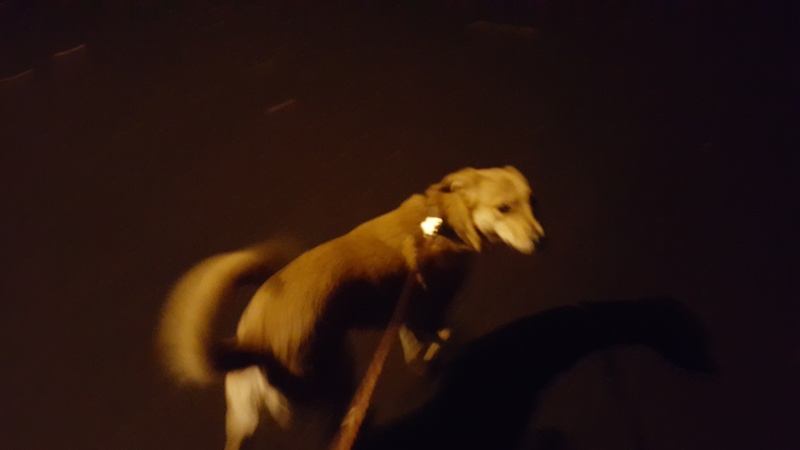 She moved so fast and with such surprising power that she tore the leash right off my wrist before I could even react. Last photo from that fateful walk…. I charged after her, but had only take two steps when she collided with the dark shape and seized it in her mouth. Appalled, I shouted at her, thinking she’d attacked one of the local cats. I reached her as she was about to shake the poor creature back and forth. Before she could, I grabbed her collar and pulled her upward. She dropped the critter right on my foot. I looked down. NOT a cat. No not a cat indeed. For a fleeting instant, I thought she’d caught our black-and-white Gaulic stink badger (Mizette the papillon, which is a breed of dog I adore but am not convinced it is truly canine. More like the missing link between cats and dogs, with a strange stray gene set from Mephitis mephitis). That fear lasted only a second, though, as my eyes registered what was sitting atop my favorite pair of topsiders. Yep. A severely annoyed skunk. North American Gaulic Stink Badger (easily misidentified with skunk). Now, some may argue that Gwenie’s nibbling on the skunk made the poor creature feel unsafe. It was perhaps a microaggression; I will concede the point. However, I would also like to point out that this particular skunk has been a carpet bagger for months now, living under my house and nocturnally raiding the cat’s food for goodies. A few months back, I was out late and coming home when I encountered this little Oreo devil standing on my porch. It saw me, puffed up its tail and hissed. Yes, the thing actually hissed at me. Ingrate. In the days before the Skunkpocaylpse, Gwen met her first goat. Here I am trying to keep her from freaking out when the goat walked up to her. So there this skunk was, sitting atop my boat shoe looking terrified, annoyed and indignant. I never saw it raise its tail. 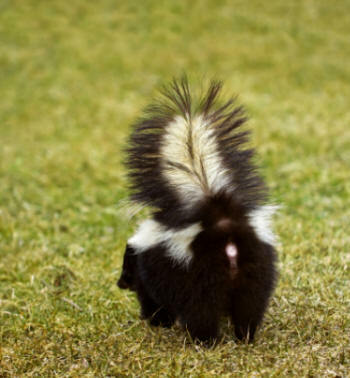 I never saw a stream of skunkstench. There was just a moment when I swear I was engulfed by greenish-yellow mist and the most repellent, noxious and nauseating smell ever to reach my nose assailed me. That’s saying something too, dear readers. I’ve been to New Orleans. What followed seems to have happened in slow motion. The skunk waddled off to go hide under the house. Gwenie chased after it, but lost interest as I screamed at her while trailing in her wake. 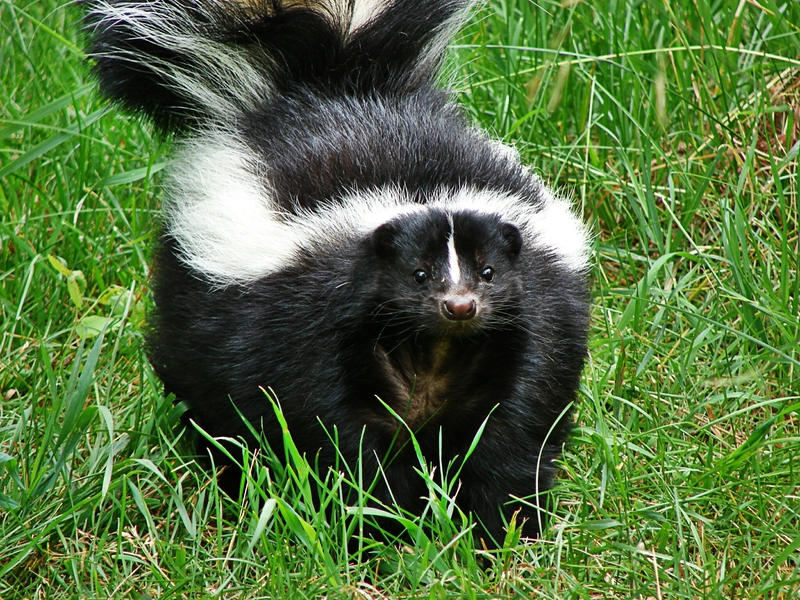 When I finally regained positive control over my Jordanian refugee, the skunk had disappeared under the house, leaving the entire neighborhood smelling like a cross between a sewage lagoon and a tire fire. Gwenie looked pretty shell-shocked. I was trying not to barf. Together, we trudged to the front porch and I knocked on the door, not wanting to go inside in our current state. In the pre-skunkpocalypse days, we were free to roam among our fellow humans, unfettered by stink badger stench. Here my daughter Renee and Gwenie pick out a a future rotting porch decoration during our refugee’s first ever trip to the local Halloween corn maze and pumpkin patch. When the fam came to the door, our stench assailed them. Undeterred, Renee and Jenn swung into crisis mode. 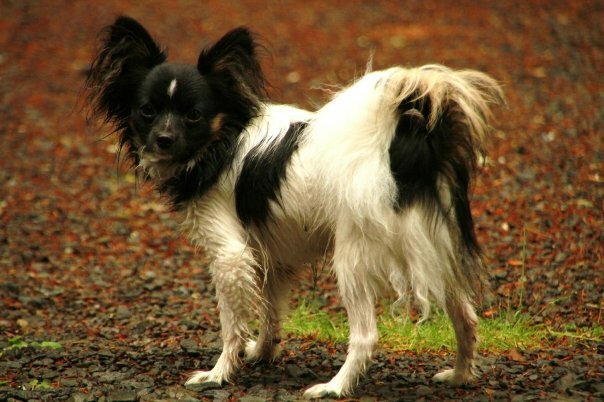 Jenn went to whip up anti-skunk potion #9: dish soap, baking soda and hydrogen peroxide–while Renee took the Jordanian Pup straight upstairs and dumped her into the tub. Despite our best efforts, the entire house filled with skunk stench. It lingered for days, got into everyone’s clothes and wrecked the upstairs bathroom and dog-washing tub for human use. Vinegar and lots of disinfectant had only limited success. Meanwhile, in the ‘hood, the skunk’s WMD detonation filled the block with the wretched reek for two days even though it rained the entire time. Meanwhile, the skunk has not been seen since the incident, which leads us to believe it is under the house, plotting revenge, possibly with the help of a domestic ISIS cell. I sat down with Gwenie the other night to discuss the incident with her. I wanted us to both smell better before we had our little face-to-face. I told her we needed to chalk this incident up as a learning experience in her continuing education on life in America. Of course, I told her that she needed to rethink chasing after non-cat critters who are smaller than she is, lest she encounter something with even nastier defensive mechanisms, such as a porcupine or a badger or a wolverine. Her new motto: Can’t we all just get along? Get along with all but the couch anyway. Came home to this scene not long before Skunkpocalypse night. Now, I don’t want to jump to any conclusions as to who might be responsible for this destruction, but…. My dog Scooter is a lot like Gwenie. He has explained that I need to learn to take life as it comes. He even suggested that I should try chewing on the couch. He says it might relax me. Hmmmm. I’m pretty stressed right now, I may have to give the couch-chomping a go. Thanks for the tip, I’ll let you know how it turns out! Well it was probably time to get a new couch anyway…that is what my dogs always say.